Saturn's moon Mimas shines in the shadow of the planet's rings. A bright moon of Saturn stands out against the planet's dark background in a photo taken by a NASA probe studying the ringed wonder and its moons. NASA's Cassini spacecraft took the photo on July 13 while it flew through the Saturn system. The ringed-planet's Death Star-like moon Mimas looks like a bright point of light on the lower left-hand side of the image, and the planet's distinctive rings appear in the middle of the photo, casting a shadow on the body of the planet. Saturn's north pole hexagon and vortex are brilliantly displayed in this photo taken in May. Mimas is sometimes known as Saturn's "Death Star moon" because the huge crater on one side of the moon makes it resemble the Death Star weapon of the "Star Wars" movie franchise. Cassini took the picture when it was about 1.1 million miles (1.8 million kilometers) from the planet and 1 million miles (1.6 million km) from Mimas, according to NASA. The space agency's probe also captured an amazing view of Saturn's rings against the backdrop of the planet in May. 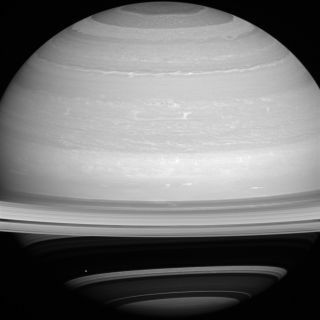 In that photo, the ring plane reflects light from the sun, with Saturn's north pole on display. Cassini took the May photo when flying about 2 million miles (3 million km) from the planet's surface. Scientists can use the data and images beamed back to Earth by Cassini to learn more about how Saturn's rings formed and why they are the most impressive planetary rings in the solar system, according to NASA. The photo taken in May also shows Saturn's hexagon and polar vortex swirling in the north pole of the planet. Scientists think the hexagon is a huge jet stream surrounding a large storm. The jet stream consists of 200 mph winds (322 km/h), and the hexagon is about 20,000 miles (30,000 km) in diameter. Another Cassini image, released in early August, zooms in on the "eye" of the storm in Saturn's north pole. This photo shows Saturn's north polar vortex and hexagonal jet stream. "Measurements have sized the 'eye' at a staggering 1,240 miles (2,000 km) across with cloud speeds as fast as 330 miles per hour (150 meters per second)," NASA officials wrote in an image description. The Cassini mission launched to Saturn in 1997. The $3.2 billion mission has sent back amazing photos of the planet and its moons since arriving in the planetary system in 2004. Cassini is in an extended mission now and should continue collecting data from Saturn until around 2017, before burning up in the planet's atmosphere.